Coming from Batterystaple Games, 20XX was first released on Steam back in November 2014, after a successful crowdfunding campaign. Originally known as Echoes of Eridu, the much snappier 20XX title refers to the year that the robots gained sentience, and decided that what they should really do is rise up against their squishy human overlords. 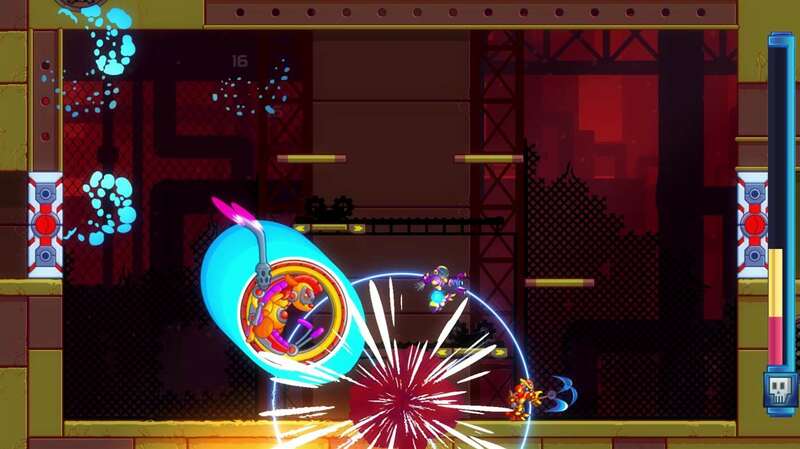 Described as “an indie roguelike action platform video game”, has time been kind to 20XX now that it is hitting the console market? 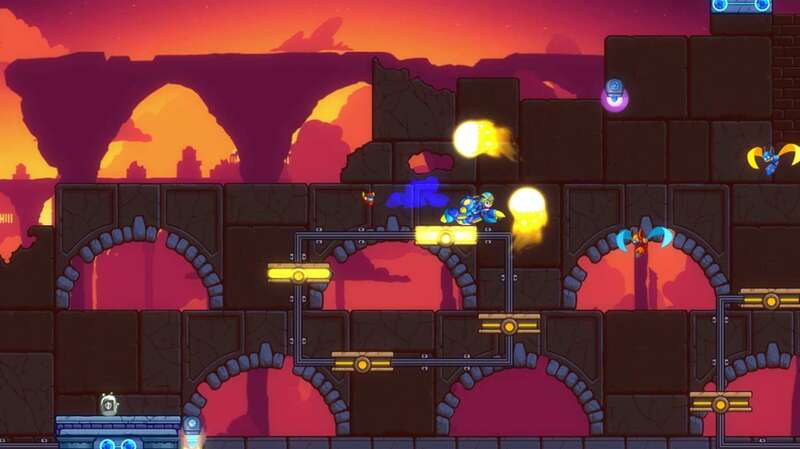 Inspired by Capcom’s Mega Man games, it transpires that the developer, a chap by the name of Chris King, decided that Capcom weren’t making enough Mega Man games, and that he and all the other Mega Man fans world wide wanted more. So, being a young man without family commitments, that’s exactly what he decided to do. 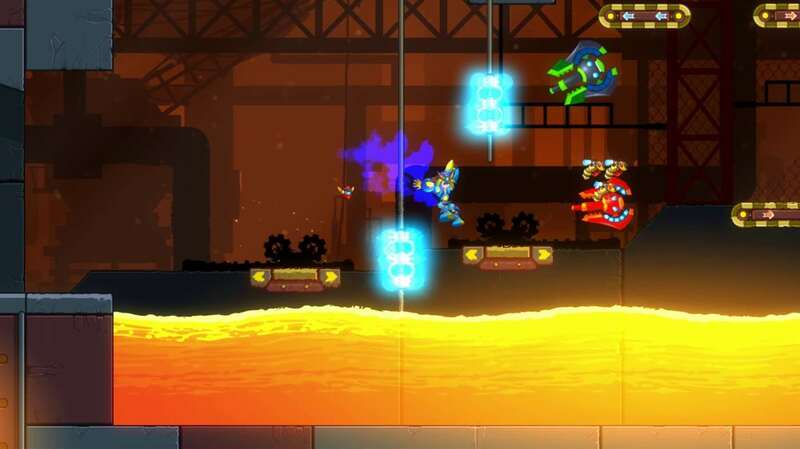 His focus was on the feel of the game, wanting it to play as much like Mega Man as possible, and in this he has succeeded, as 20XX feels and plays almost exactly like it was written by Capcom themselves, right down to the diabolical difficulty curve. The plot, such as it is, revolves around a pair of protagonists. Nina, an armoured suit wearing female is armed with a power blaster, and Ace, an armoured male equipped with an energy blade, must go into the various levels, kill bad robots, execute pinpoint platforming antics, and then defeat an end of level boss. In a clear nod to the Mega Man games, when the bosses are beaten, it is possible to take their powers for yourself, with each boss giving you a different attack. If you don’t fancy the power, you can choose to receive a gift of bolts – the currency – or a random passive upgrade instead. As you fight your way through the levels, you will come across enemies that look slightly different from the normal ones, shinier if you will, and when you defeat these they drop another in-game currency – Soul Chips. These Soul Chips feed onto the roguelike element of things, as in a break from the Mega Man tradition, you don’t get multiple lives, you get permadeath instead, keeping the Soul Chips you collected on the previous run. These can then be used to unlock and equip various passive upgrades, such as increased damage or health, before you feed into the next run, making you that little bit stronger, that little bit deadlier, that little bit harder to kill. It is only then when you will find yourself moving further into the levels. There is another twist to 20XX: all the levels are randomly generated from sections, or “chunks”. These can be put together in any order, and makes the chances of playing the same level more than once somewhat remote. When you begin a run, the level and the boss you’ll face at the end (should you make it there!) are randomly chosen as well. Once you get through, taking the boss down, you can then select which you want to fight next, from a choice of three. Luckily, the bosses have a weakness to one of the other boss powers, so beating one guy in order to grab a new power so you can take down another, is par for the course. As you go through the levels, you also come across vending machines that let you spend your bolts, allowing you to gain more health and more NRG, which is used for powering the special abilities you pick up. There are also crates dotted about that can deliver health, NRG, armour, bolts, or even a passive upgrade to ease your passage. Gameplay wise and 20XX is a hard one. And I mean properly hard, with pixel perfect jumping, pinpoint shooting and bang on timing. The controls are equal to the task thankfully, and the game reacts exactly as you would hope it would in reaction to your inputs, with a control scheme that is simplicity in itself – jump, shoot, dash, and use boss powers! The rest of the gameplay is down to you and your reactions! Despite the hardness and the level of perfection demanded, the game never feels unfair and you can definitely look back and see exactly where you went wrong, whether it be trying to jump on a moving platform when you know you should wait, or getting cocky with the smaller, weaker enemies and trying to take liberties. Just to add to the pressure as well, there is an optional time limit on each level, and if you can take the boss down before it expires, you will receive extra rewards. Fortunately, if it’s all too much for you, there is a multiplayer option, either in couch co-op or with an online partner. The couch co-op works very well, with one player taking on Nina, and the other Ace. The game zooms out as the characters get geographically separated, and this can cause a few issues, as when you are a tiny dot trying to make a tricky jump it makes it very hard. It’s very well done though and if your partner dies it’s possible to respawn them by finding a particular machine, so death needn’t be the end. Of course, with two good guys, the baddies get stronger, so it’s a calculated gamble that you will need to consider. 20XX doesn’t suffer for having two protagonists, and continues to run silky smooth, with nary a hint of slowdown. Sadly, as this is written before general release, the online co-op is dead, but you should obviously expect to see that up and running properly after release. Graphically the game is a delight, harking back to the glory days of the SNES and featuring large, colourful sprites oozing with personality. The character and enemy designs are very good, with Nina in particular looking like a female Mega Man. The enemies are based around various animals; flappy bees, rocket powered penguins and things that look like mutated scorpions. In a nice touch, killing enemies unlocks Datalore entries about them, so you can read about how they came about. It’s a nice little addition that shows the depth of thought that went into the game. The bosses are an imaginative bunch as well, ranging from a giant face to a bat type creature, each with their own attack patterns to learn and weaknesses to exploit. Luckily, even though the run up to the bosses can change, the bosses themselves don’t, so once you stumble over the pattern, you can then beat them time after time. In theory, that is. The sound effects are again straight out of the ’90s, with catchy tunes that seem to be a mixture of chiptune and synthesiser, evoking an arcade feel. The enemies and your attacks all have a nicely retro sound too, so all in all the game experience is like slipping into a nice warm bath of nostalgia, until the difficulty makes you cry. 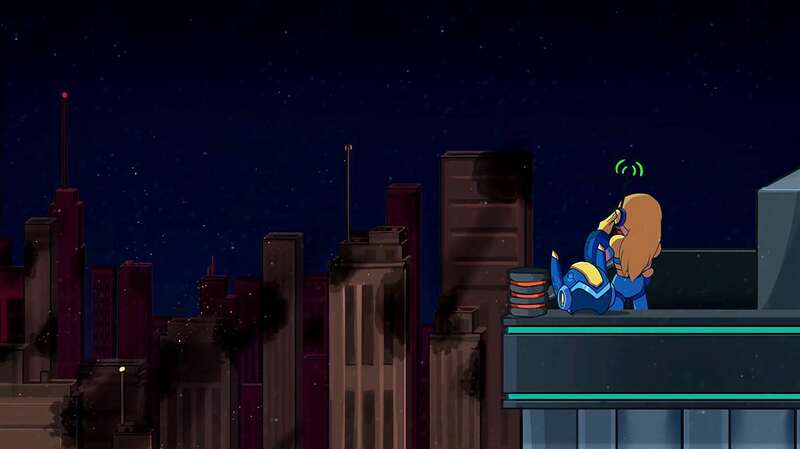 If you are looking for a slice of rock hard gaming nostalgia, I can recommend 20XX to you. It is hard but not unfair, demanding more of you as a gamer than any game I’ve played in recent times. If you put in the effort, it will reward you with a pure gaming high, but the difficulty may put some people off. I’ve really enjoyed my time with 20XX, and my trip down gaming’s Memory Lane – back to a time when games were hard and gamers were determined. And it is for that reason you may as well give 20XX a try. What have you got to lose?